Each year the WHO alters the influenza vaccine depending on the dominant strains circulating the World. The 2018 quadrivalent vaccine differs from the 2017 vaccine. In Victoria the vaccine is funded for children from 6months of age to 5 years. Two doses are needed initially, 4 weeks apart if under 9 years then annually. The ‘flu’ or influenza is caused by a virus which can readily mutate. The symptoms include high fever, headache, muscular aches and pains and lethargy. After 48 hours there can a slight runny nose and sore throat. In most people symptoms improve after 7 – 8 days. However during this period many people are bed bound. Many children complain of calf tenderness and may have trouble walking. In certain situations this virus can cause complications such as pneumonia, myocarditis, (heart inflammation) encephalitis, (brain inflammation) and seizures. Those with underlying medical problems such as asthma, or diabetes are particularly susceptible. Deaths from influenza are usually due to respiratory failure. Influenza causes the highest number of hospitalisations of all vaccine preventable diseases. How do you catch influenza ? Influenza is spread easily, mainly through large particle droplets generated by sneezing and coughing. Droplets also settle onto surfaces, and can then pass from hands to the nose, mouth or eyes. People with influenza can be infectious to others from the 24 hours before symptoms start until a week after the start of symptoms. In previously healthy individuals, symptoms typically subside within 5–8 days. Between 10-40% of all children will catch influenza each year in Australia. Vaccine effectiveness – This is a moderately effective vaccine against the particular strains it covers. Common side effects following flu vaccination include soreness, redness, pain and swelling at the injection site. Occasionally fever and malaise. These side effects are usually mild and resolve within a few days. There is no live virus in the flu shot – so it cannot ’cause the flu’….a common myth. People with a chronic disease have a 40 times increased risk of death from influenza. Who should get the vaccine ? Annual influenza vaccination is recommended for any adult or child (over 6 months of age) who wishes (or whose parents wish them) to be protected against influenza. Influenza vaccination is recommended annually, even if a person has been vaccinated in any previous year(s) with an influenza vaccine that contains the same strains. This is because the immunity to influenza acquired by vaccination wanes rapidly. Which Brand and Dosage for Children? Each subsequent year there is only need for one injection. Is Influenza Vaccine Safe ? The first influenza vaccine was developed in 1944. The current inactivated vaccine is safe, moderately effective, and not associated with serious side effects. The most common of these, are a sore arm for 48hours and some swelling at the injection site. Can the influenza vaccine cause the ‘flu’? Being an inactivated virus it cannot ’cause the flu’. However some people will feel a few days of flu like symptoms. There is no causal link between the vaccine causing a viral illness. Why is fluvax® not approved in under 5s ? In 2010 in Western Australia fluvax was given to all children under 5 years. An unacceptable number of reactions occurred, which was linked to only this brand of fluvaccine. The other brands have not had the same side effects and so are acceptable in young children. This vaccine has now been superseded. How do I get the flu vaccine ? This is available privately from doctors and chemists. Some doctors will give a script and the chemist will dispense the vaccine. In that case it needs to be given shortly afterwards due to ensuring the vaccine temperature is not compromised. 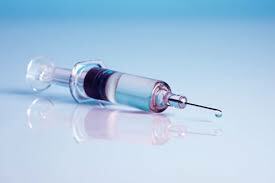 Some practices will have their own stock of private fluvaccines. If your child has a underlying condition as outlined in the table above they should receive the vaccine for free. Should I get Quadrivalent Fluvaccine ? Yes, quadrivalent vaccine includes two A strains and two B strains. Recently in the Northern Hemisphere the B strains have become quite different and so it was felt necessary to add a B strain to the current dosage. How effective is the flu vaccine ? A two-year study of children aged 6-24 months who were immunised, showed that >89% had produced effective antibodies against influenza strains. My child is healthy why should I get the vaccine ? A large percentage of daycare viruses are influenza and children will bring these home resulting in spread to other family members. The elderly are particularly prone to influenza (2-3000 deaths per year) and many of these are infected from healthy grandchildren. 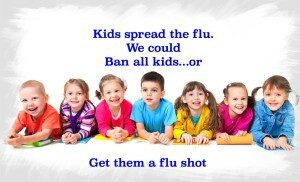 If a family member has cancer or another chronic condition vaccinating children helps prevent them contracting the flu. 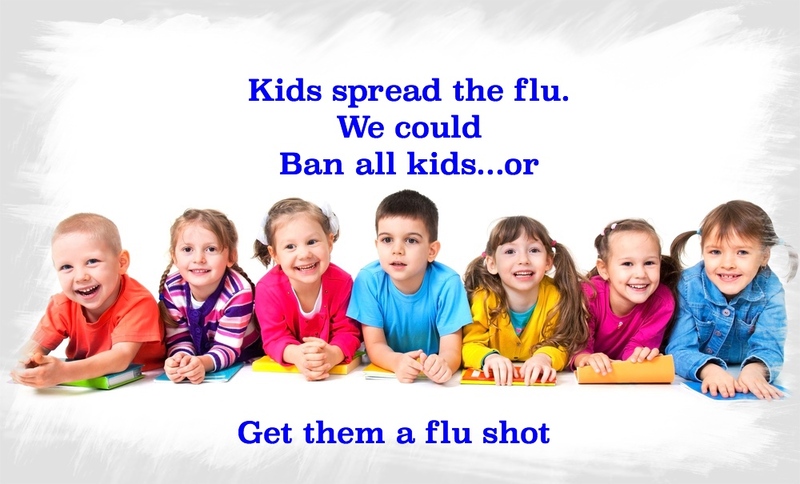 The vaccine appears more effective in children than the elderly.